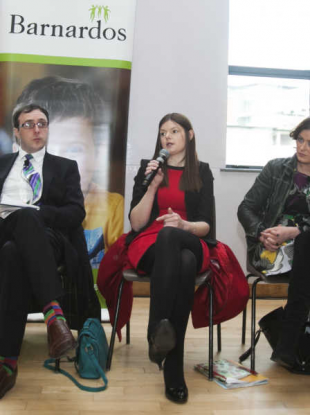 Fianna Fáil's Deputy Robert Troy, Sinn Fein candidate Kathleen Funchion, Fine Gael Councillor, Kate O'Connell at the children's hustings in St Enda's School Hall, Carmelite Centre, Aungier Street, Dublin. IN A SCHOOL hall in Dublin’s south inner-city, six general election candidates from across the political spectrum were trying to win the hearts and minds of an audience. Two weeks out from an election, that’s hardly surprising. However, hearts and minds were really all that were up for grabs as the audience was comprised of 11 and 12 year-olds. The children of St Enda’s in Dublin 8 had been brought into the airy school hall in the Carmelite Community Centre by Barnardos, the ISPCC and the Children’s Rights Alliance. The object, Barnardos CEO Fergus Finlay said, was to remind the candidates that children had an interest in the election, even if they couldn’t show that at the ballot box. And so the candidates were asked about smoking, diversity and their priorities if elected. It’s an odd thing to watch politicians, who are used to pitching their ideas at the doorsteps and to media, try to translate that to talking to children. To some extent, they all struggled, reverting to the “doorstep pitch” which has become their main form of communication in the last month. Some of that could have been nerves, with the Social Democrats’ Gary Gannon saying he was more nervous talking to the students than he was among business leaders the previous morning. Gannon told the kids that the most important thing a government could do for them is to provide a free primary education “that is actually free”. Junior minister Kevin Humphreys put himself in temporary exile from the other candidates, but because he was suffering with flu rather than any political beef. He left early to see a doctor, but not before speaking of his own battle with cancer during a question about anti-smoking initiatives. Richard Boyd Barrett spoke about the “rights” all children should have, before calling an idea for electric cars used as taxis in the city a “fantastic idea”, jokingly saying it would become a new People Before Profit policy. With a press conference to get to, Boyd Barrett bailed, tagging in fellow PBP candidate Annette Mooney, herself a school teacher. She spoke of how difficult it is to teach practical classes with the current student-teacher ratios. Fine Gael’s Kate O’Connell said that she wanted to see the country’s hospitals given attention. She told a story how her own child had spent time in Crumlin Children’s Hospital as a baby, realising that parts hadn’t changed since her husband had his tonsils out as a child. She emphasised how long this had been by telling the kids her husband was “nearly 40″. Sinn Féin’s Kathleen Funchion arrived late, citing “transportation issues”. She said that she would have been in trouble had been in school. She too said that class sizes can be problematic at primary school because it can “impact self-esteem” before children hit secondary. Robert Troy, Fianna Fáil’s spokesperson on children, told stories of attending a small rural school and, in a Catholic school, said that the State cannot force parents to baptise children. He said he was a practising Catholic himself, but felt that baptism shouldn’t be done for schooling reasons. While there were some nice, human moments, the candidates tended to revert to the party lines: recovery, a better recovery, rent certainty, lowering the voting age. Finlay told the audience that if the audience were a little older the candidates “would have been dug out of each other”. Which would have been a more entertaining spectacle, but probably not suitable for a school. Email “Here's what happened when seven politicians took questions from kids”. Feedback on “Here's what happened when seven politicians took questions from kids”.